Some of you mentioned you kinda liked my button blossom cookies in my last post. I have to admit I'm a bit taken by them myself, there is something super sweet about button cookies. Forget cute as a button, I think the saying should be cute as a button cookie. This cookie was part of a set I designed and made for my sister in law's baby shower. She's an artist and sits more on the quirky cool side of things than traditional, so I thought baby bottles and onesies wouldn't cut it. They were probably more cutesy than she's used to but hey, I am who I am and I think she was happy with them. and big thanks to all of you who follow me on facebook and helped me out with these ones. I was unsure of whether to put the stitching around the edges and you convinced me it looked better with the faux stitching. Some of you also recommended different colours so here you go while doing this tutorial I made up a few of your suggestions. Yup you get the picture this cookie looks pretty good in a variety of colours. As a thank you I've done up a little tutorial to show how I made them. 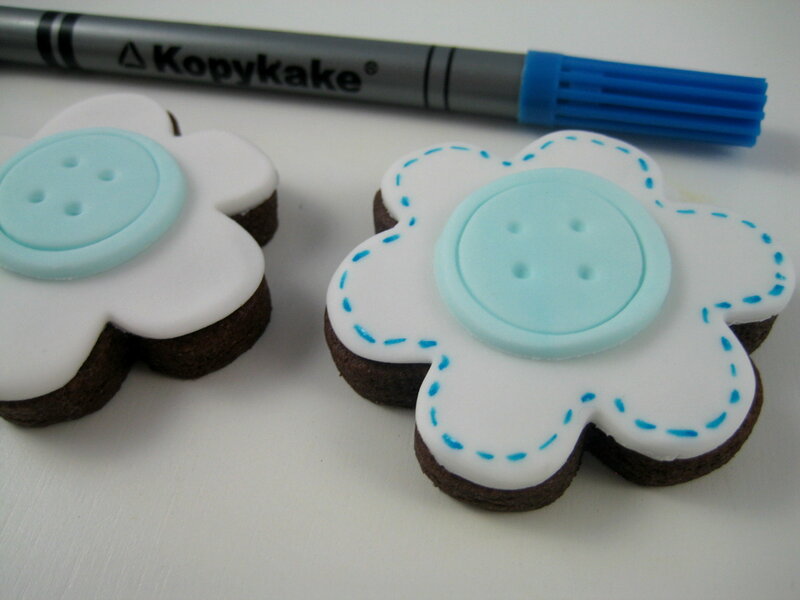 Roll out light blue fondant and using the larger size circle cutter cut out enough rounds to place in the middle of each cookie. Adhere blue rounds to the center of each cookie with a small amount of water. The Wilton tips in this picture are a little different that the ones I suggested as I was making a different size, like I said use what you have. 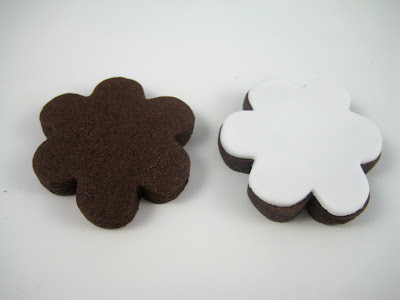 Using the slightly smaller round cutter press lightly into the larger round fondant cutout to leave an impression. Using the end of the paintbrush gently push 4 indents to replicate the holes in a button. If you would like to add 'stitching' in edible pen I recommend allowing the fondant to dry a little. Then draw on the stitches using short stokes all around the edge of the cookie. I love them! Very cute. You are such a clever pants. They are super cute, love, love! They are too gorgeous. The pink with pink stitching win for me! OH my goodness - I thought this was a craft blog when I stumbled upon your photos, they're thaaaat perfect ! Super cute. Very nice job Linda and thanks for the tutorial! Those buttons look so cute, I may not have the patience to try out these creative ones. Oh, the stitched flower -- I LOVE it! I made a cake with buttons on it last year for a baby shower and made them the same way! I'm so not a professional decorator so I thought was fun to know I did that right. :) It's probably more interesting for me than you though! So I made some of these today and I wasn't sure what thickness you rolled yours too, the cookies are very crunchy is this how they are supposed to be? Hi my cookies are around 7mm or so, you can make them thinner or thicker as you like. They are a very firm cookie, I wouldn't call them crunchy, perhaps if yours are really crunchy you have rolled them thinner or cooked for a little bit longer. A small dessert that feeds a big crowd... it's so amazingly delicious and rich you can only have 1 piece!